The classic micromanipulator developed by Sir Huxley many years ago is still considered by many investigators to be the finest manual micromanipulator available. The MP-85 offers the advantage of a very large range of movement with its built-in coarse manipulator and precise submicron movement with the fine controls. Coarse positioning is achieved with a three axis manipulator mounted on top. The ultrafine positioning is accomplished with the large micrometers mounted on the base. These micrometers provide smooth, precise movement through a 10:1 reduction mechanism. The brass and stainless steel construction of the MP-85 makes for a very heavy and solid micromanipulator with excellent damping properties. This exceptionally stable design is ideal for patch clamp recording, intracellular recording, or any other application that is intolerant of drift. The MP-85 is chrome-plated and anodized to prevent corrosion. The J.R. Wall designed rotating base is machined from solid stainless steel with a brass spindle; a thin PTFE inert washer provides for the bearing surface. Please contact Sutter Instrument for any additional information on the suitability and use of the MP-85 micromanipulator for your specific application. Dual springing of the moment arms to insure zero backlash and zero torsion. The micromanipulator is mounted on a precision rotating base featuring a positive stop and lock. The coarse movement is an all cross-roller bearing design consisting of coarse X, Y, and Z with an additional fine X motion. 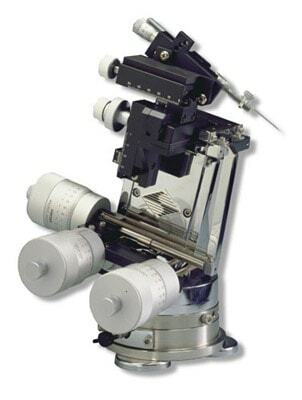 The micromanipulator can be ordered in either a right or left handed version. Fifteen degree stackable wedges for tilting the manipulator. A set of three magnetic feet for increased stability. One inch thick, chrome plated, solid brass riser blocks.